Sea Star Pendant - Choose your stone color! 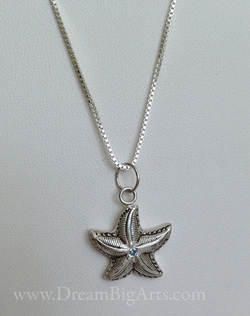 This beautiful sea star is solid fine silver, handcrafted in the US and just darling! Accented with the stone color of your choice, this darling necklace keeps the treasures of summer with you all year long! 18" sterling box chain included. Please allow 2 - 3 weeks for delivery on this custom piece. Choose stone color from drop down menu below.